Combine all sauce ingredients in a medium sized bowl, whisking until smooth. Add more water if you would like the consistency thinner. Transfer to a serving bowl and sprinkle with chopped peanuts. In a medium saucepan, boil enough water to cover the shrimp. Once the water comes to a boil, add shrimp and cook for 1 to 1 1/2 minutes until shrimp is pink and opaque. Immediately remove the shrimp from the water, drain and cool in the refrigerator. 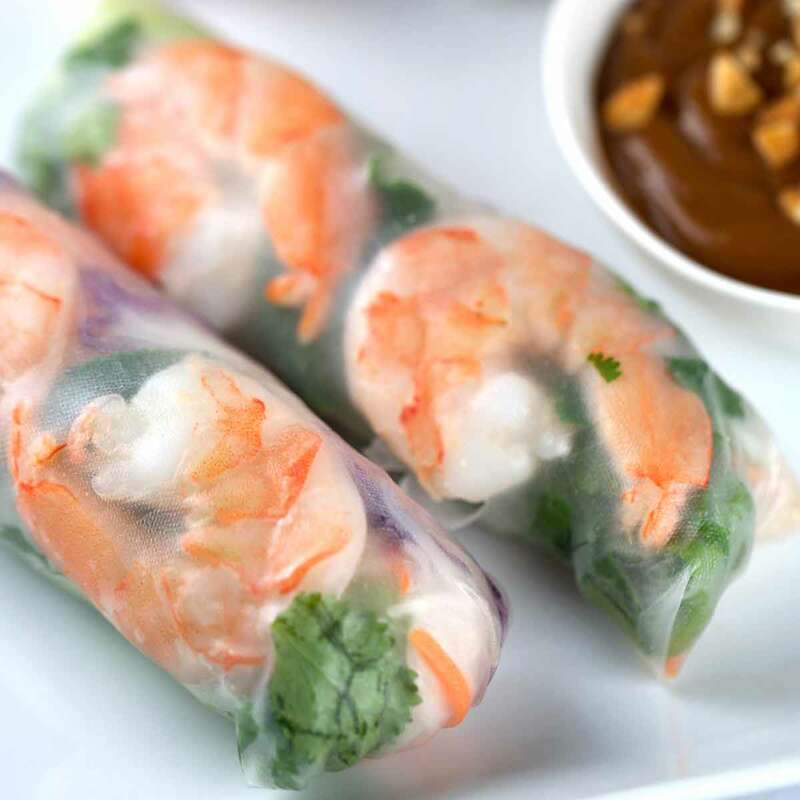 Once cooked, remove the shell and cut the shrimp lengthwise in half to give two pieces of shrimp. Set aside. Fill a pie dish or large bowl with water, large enough to hold the piece of rice paper. Set a damp dish towel on a cutting board. Immerse one rice paper sheet into the water for 15 to 20 seconds. Remove, shaking off excess water and lay flat on the dampened cloth. The paper may still seem stiff, however with become pliable as you build each roll. Lay once piece of lettuce over the bottom third of the rice paper. On the lettuce, place 2 to 3 tablespoon of noodles, 1 tablespoon of carrots, 1 tablespoon of cabbage, and a few bean sprouts. Roll up the paper halfway into a cylinder. Fold in the sides in an envelope pattern. Lay 2 shrimp halves, cut side down, along the crease. Place a few cilantro and mint leaves next to the shrimp. Keep rolling the paper into a tight cylinder to seal. Repeat with remaining wrappers. Store with seam side down. Serve immediately with the peanut dipping sauce.